All houses have three recycling bins: for glass and cans, for organic matter and trash. All organic refuse we use in the garden and to feed the wildlife animals that live on the grounds. Glass and cans get picked up by a recycling company. The local trash truck picks up non-recycling trash. We also recycle batteries, paper and textiles. The private walkway to the unspoiled beach in front of Congo Bongo is built from 207 recycled truck tires. We put recycled wood and sand in the tires to make it a more comfortable to walk. It is a walkway of 210 meters (230 yards) to the lovely and beautiful beach. Many people have taken pictures and used the concept in other projects in- and outside Costa Rica. We like to be creative at Congo Bongo and find many ways to do that. You will find recycled bottles used in the houses as decoration. They are hanging, used as lamps and also worked into the shower walls. We have used recycled large water bottles in our parking area. They mark each house’s parking spot and at night they illuminate. We think that is a good use of items that are often disposed of. If you feel like contributing to our reforestation project you may do so. You can adopt a tree at Congo Bongo and have your name placed by the tree to show you are taking care of the world. With your help we hope to keep on planting to save and protect the natural beauty of the Caribbean Coast of Costa Rica. Please join us as we live green and love the trees around us all. 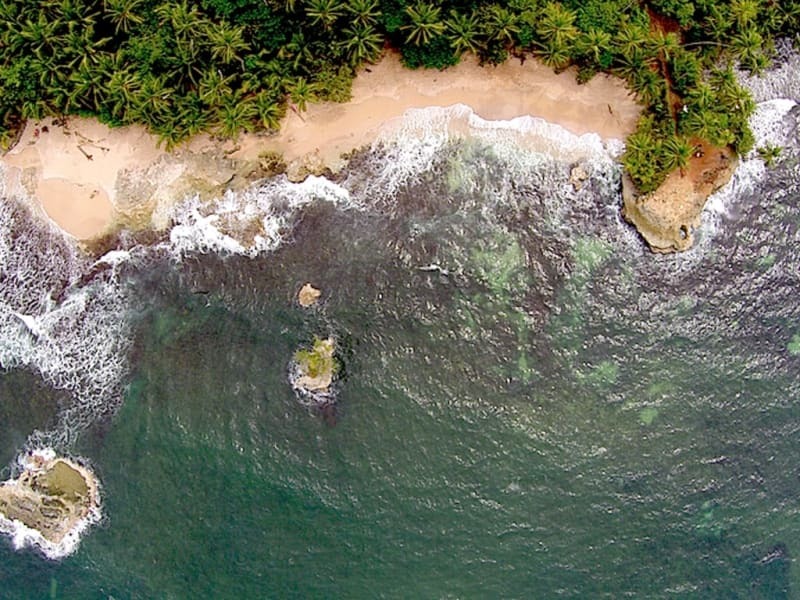 Congo Bongo Ecolodges Manzanillo is daily working on a better way of taking care of the world. Now with all cleaning products like washing powder, dish cleaners soap, floor cleaning products, bathroom cleaning products and much more now without any toxic or any chemicals. We believe we all give a hand to a better world and take very good of nature with using daily this kind of products. All houses in Congo Bongo use low energy light bulbs and a gas heater for the shower. We use some roof material that is transparent plastic. This way we save energy on a cloudy day. No need to turn the lights on. Our staff does a daily beach cleaning in front of the property. They rake the whole beach and get it ready so the guests can have a true beach day in paradise. Also, we try to keep the whole shoreline clean of plastic. This is a stretch of 6 kilometers in total that stretches from Manzanillo to Punta Uva. We also support other projects. We are always looking for new or established projects that we can assist. The focus is on those which aid animals and nature. We support efforts in the area as well as other areas in the world. If we all make little contributions we believe the world will be a better world.